The key to a productive business is keeping employees happy. If you are running a storefront business, creating a positive environment through color psychology will promote upbeat moods and encourage customers to buy. This approach works in offices and other business spaces as well. 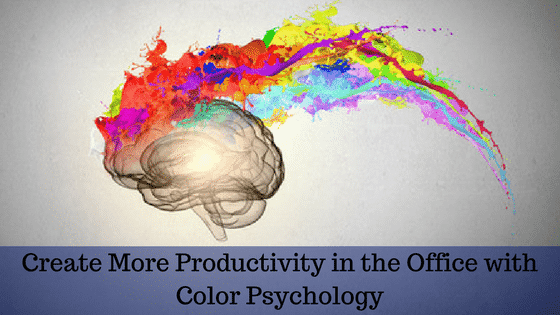 The following explains how colors are best used in the workplace. To keep things flowing in both work areas and meeting rooms, use the color green. Green is associated with thinking outside the box and will encourage originality and innovation. It is best to offset green with some white to prevent an overwhelming sensation. A busy workplace with a high stress level needs colors that calm and soothe the nerves. To reduce feelings of chaos and decrease the amount of buzz in the air, try shades of blue in the work areas. Blue is known to lower the heart rate and brings a sense of calm. It also reduces the urge to overeat. Blue is perfect for break rooms, making the space feel like an oasis. If you want your employees and customers to feel a sense of value from your business, consider using the paint color orange. As an accent color, orange conveys that your services and products are the perfect solution for customer needs, and they are also being offered at the best possible price. Red is a bold color that seems like it would motivate workers, but it tends to provoke angry feelings and should be avoided. The color raises blood pressure, increases heart rate and encourages conflict, which you do not want in the workplace. A small exception to this rule is when you need to draw attention to something or your workers must stay very active all day, then red can be used sparingly as an accent color. A study on color psychology from the University of Texas found that there is a gender difference in how people respond to color. Women felt depressed in environments featuring shades of white and beige while men were saddened by orange and purple. These combinations should be avoided to keep your workers in the best frame of mind. A business with numerous deadlines needs to be as efficient as possible. Subtle shades of blue and green increase focus and keep productivity high. Both colors promote a feeling of calm and prevent workers from experiencing eye fatigue. Blues and greens also reduce feelings of anxiety and keep heart rates at a normal level. You should avoid darker tones of these colors because they can make people feel sad. A good paint color to promote optimism and innovation is yellow. Used as an accent, it will help your workers to get in touch with their creative energy. Do not use too much yellow or a bright shade as this can make people feel hungry and angry. If you are not sure of which colors to use in your business, contact a commercial painting service for expert advice and the best results.